In case you missed it, here is a great video from Le Poisson Rouge in NYC…featuring some great musicians and my entire Hammond rig, including effects. I am sitting here at 3:50pm, trying to gauge when this storm is going to hit, and thinking about the last couple days. My weekend trip to CT for the Roy wedding was excellent. Seth’s played great, and the guests all had a great time. Monday I returned to Brooklyn and had an excellent dinner with my friends Gretchen and Jess. The merging habits on the Merritt hurt my faith in the human race, but otherwise it was a pretty low-key day. Tuesday I traveled. I went to Queens to hang with my good friend Mark and his wife Jan. Visiting them is always amazing. It is kind of like visiting a zen master. We eat. We talk. He shows me what he is working on. We compare notes about cooking (this time, about bread). And I walk away with one concept that will focus my practicing for the next several months. This time, it was pulse. Victor Wooten talks about pulse a lot. We spent some time trying to feel 4 BPM. You only get one click every 8 bars. As usual, I was in awe! Later, I traveled to New Rochelle for dinner with a former advisee and his parents. They were more than gracious, and dinner was delicious! We talked and played music and generally had a great time. I arrived around 7, and we had to rush to get me to the 11:30 train! What fabulous people. Being a teacher and having summers free to explore and think is really rewarding. Getting to hang with people and relax is something that I don’t think we do often enough. For example, Mark is working on mastering monkey fist knots rights now, and ciabatta bread. I am working on sourdough. The Lans family is getting ready to head west, and attends numerous concerts in NYC. Good stuff! 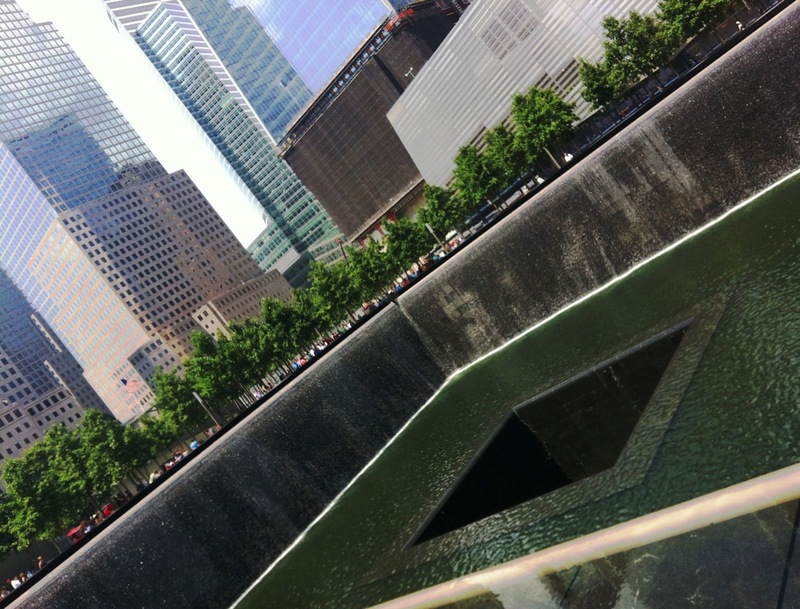 Today, despite the heat, I decided to head into Manhattan and visit the 9/11 memorial. Being in the midst of the reconstruction was pretty powerful. I can only imagine what it was like after the destruction. The memorial pools were beautiful. When all the trees in the park mature and construction is finished, it will be a serene space in the heart of lower Manhattan business! Zuccotti park is right there too. It seems to be a tiny place to Occupy, but it is right in the heart of the financial district. The towers around there are rather intimidating. After spending a little while in the park, I headed south to Battery Park. 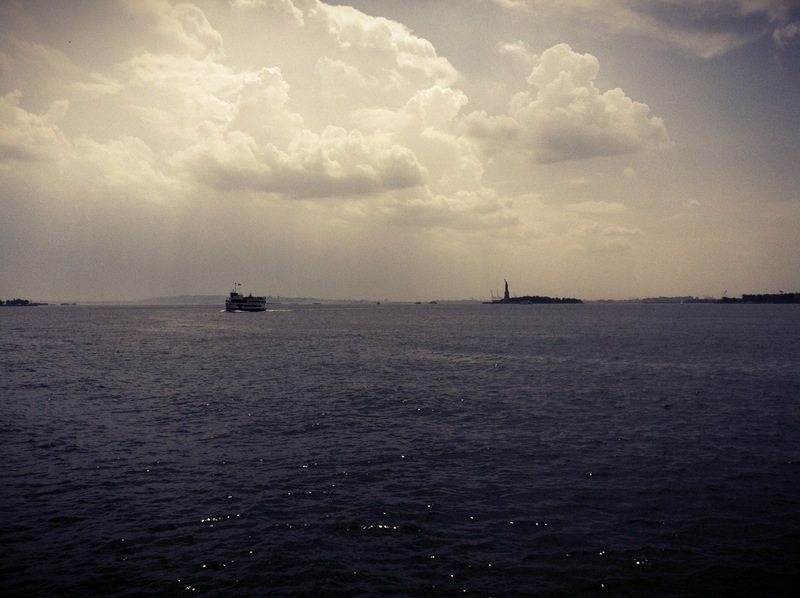 The views across the harbor to the Statue of Liberty, New Jersey, and Brooklyn were great. Looking north it was clear that a storm was brewing so I did not linger too long. Despite my best efforts, I ended up getting wet. But not too bad. One of my summer projects was to learn how to enjoy walking in the rain. With an approaching thunderstorm, I felt like I needed to hustle regardless. However, the rain was warm and refreshing. Hopefully I am in for the evening now. I can make some dinner, do some laundry, read a little, and plan my day for tomorrow!